Baseball is a treasured American pastime! Every year, Albuquerque locals eagerly await the day they can put on their favorite Albuquerque Isotopes hats and jerseys to cheer on their beloved baseball team to a winning season. There are other popular events that take place in the spring, but Isotopes baseball games are one of the most anticipated annual happenings! The Isotopes schedule is online, and you can buy your tickets on their website as well, which makes attending the games easy and stress-free! Discover everything there is to know about the Albuquerque Isotopes and make plans to attend their next game. Baseball in Albuquerque dates all the way back to 1880 when the first baseball team, the Browns, was formed. In 1915, the first professional team, the Albuquerque Dukes, was established, followed by the Albuquerque Dons in 1932. After years of many changes and challenges, the Albuquerque Isotopes were created in 2003 and have gained immense popularity ever since, drawing countless fans through its gates to experience the excitement and thrill of a live baseball game. Considered one of the finest baseball diamonds in the country, Isotopes Park has been open since 2003. A massive park that can fit up to 11,124 attendees, it features comfortable stadium seats (complete with cupholders! ), a grassy lawn for those who want to lounge on picnic blankets, and a Fun Zone, where kids can hop aboard carnival rides, play games, jump around in an inflatable house, and much more! If you want to explore this stadium more thoroughly, you can take an Isotopes Park Stadium Tour on non-game days to receive an exclusive, behind-the-scenes look at what goes into making these games possible. Set within a fun and exciting environment, the Albuquerque Isotopes games are an enjoyable experience for all ages! Chow down on some tasty treats from the concessions stand, like the classic Enchilada Dog. Keep your eyes peeled for the goofy Isotopes mascot, Orbit; you can’t miss this tall alien with his bright yellow and orange fur and crazy antennae! Be sure to stop by the Isotopes Park Pro Shop to get all your team’s gear while you’re here. Make the most of your trip to Albuquerque by staying in our historic inn, conveniently located in the heart of Old Town. 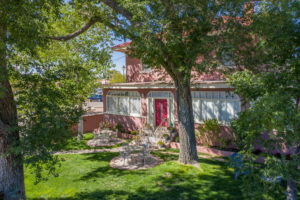 The Bottger Mansion of Old Town is a charming bed and breakfast in Albuquerque specializing in comfortable rooms and friendly hospitality. Explore the many attractions of Albuquerque or simply relax in our shady courtyard. Experience central New Mexico for an unforgettable adventure. With amazing scenery of towering mountains, endless blue skies, views that go forever, and expansive wilderness areas, opportunities for outdoor recreation are endless. You will love your time in New Mexico, so check our availability and book your stay today!